Street Twin-like styling with a nostalgic twist! The 2019 Speed Twin draws inspiration from Triumph’s first parallel-twin motorcycle, the 1938 Speed Twin. That motorcycle was a revelation in its time and was distinctly different (in a very good way) from all the other single-cylinder motorcycles. So much that the brand says it redefined what a “rider’s bike” should be. With the new Speed Twin, Triumph aims to offer a good balance of performance, engaging but accessible riding experience and handling. This motorcycle looks nothing like its forefather, though. In fact, it is actually more in tune with its smaller brother, the Street Twin. However the Speed Twin looks a lot more butch when compared to its 900cc counterpart. You get a classic-looking round headlamp with a twin-pod instrument cluster that sits on top. They feature an analogue speedometer and tachometer and a digital inset in each pod for displaying vital information like fuel level, distance-to-empty, gear position, fuel consumption, tripmeter, etc. The handlebar sits a little low and wide. This, along with the slightly rear-set footpegs and the single-piece seat, result in a comfortable yet slightly sporty, roadster-like ergonomics. As usual, the attention to detail is impeccable. Case in point is the brushed metal highlights on the side boxes which looks like it fluidly connects to the fuel injector cover. The rear is dominated by a fat 160-section tyre flanked by twin megaphone-style exhausts. 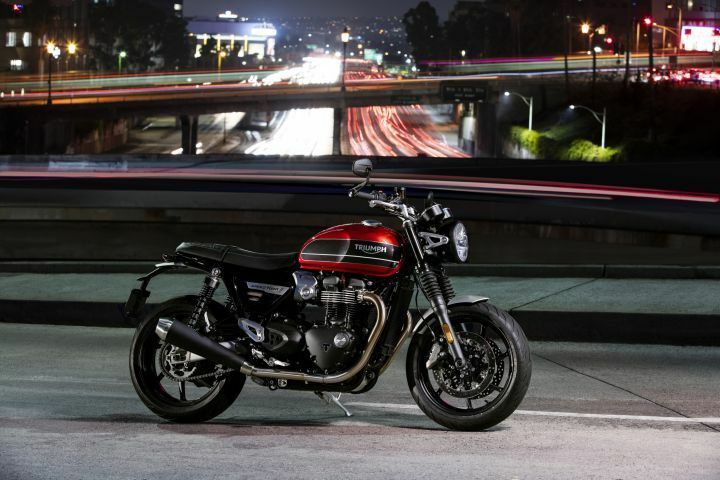 The Speed Twin employs the same 1200cc, 8-valve, SOHC liquid-cooled High Power parallel-twin engine as the Thruxton 1200. With 97PS at 6750rpm and 112Nm at 4950rpm on tap, the power and torque figures have been retained as well. Transmission duties are handled by a 6-speed gearbox with torque-assist clutch. Interestingly, the engine in this bike is 2.5kg lighter than the one of the Thruxton thanks to a new magnesium cam cover, a revised clutch assembly and new mass-optimised engine covers. All that power is reined by electronic rider aids such as ride-by-wire, Sport, Rain and Road riding modes, switchable traction control, and dual-channel ABS (not switchable). Interestingly, despite weighing 10kg lighter (196kg dry) than the Thruxton, the Speed Twin returns 0.9kmpl less, at 20.83kmpl (claimed). With a 14.5-litre fuel tank, you should get a little over 300km on a tank full. In theory, at least. The engine sits inside a tubular steel aluminium cradle frame with an aluminium swingarm. Road undulations are absorbed by 41mm KYB telescopic forks with cartridge damping and twin KYB shock absorbers with adjustable preload. This setup is akin to the Thruxton 1200, but the brakes are much more superior, though. You get a pair of 305mm discs with Brembo 4-piston calipers up front and 220mm disc grabbed by a Nissin 2-piston caliper at the rear. The cast aluminium alloy wheels measure 17 inches on both ends and are wrapped with Pirelli Rosso Corsa 3 tyres. A high service interval of 16,000km should ensure hassle-free ownership experience. When the motorcycle comes to India, it will compete with the Kawasaki Z900RS and the BMW R nineT. The Speed Twin is likely to have a more competitive pricing than the other two that are sold via the CBU route. Share your experiences with Bonneville Speed Twin?